Many teachers are looking for fun ways to incorporate technology into their classroom to keep their students motivated and wanting to learn! With many districts going 1:1 with chromebooks for their students, it is increasingly important to integrate technology into daily classroom routines as much as possible! 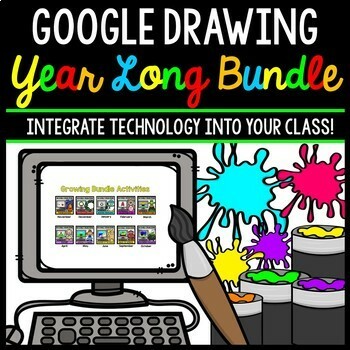 My students LOVE Google Drawing and I am sure yours will too! These activities were specifically designed with special education students in mind, but any classroom could benefit from the visual, step by step directions in this process. It would be a great introduction activity for any class! 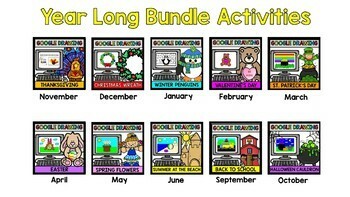 Due to popular demand, I have decided to create a YEAR LONG BUNDLE for my Google Drawing activities! This bundle has 10 items uploaded and would retail at $50. Buy it now for only $40! That is a 20% savings! Google Drawing - Thanksgiving Turkey (November): Click Here! Google Drawing - Christmas Wreaths (December): Click Here! Google Drawing - Penguin (January): Click Here! Google Drawing - Valentine's Day (February): Click Here! Google Drawing - St. Patrick's Day (March): Click Here! Google Drawing - Easter Bunny (April): Click Here! Google Drawing - Flower Pots (May): Click Here! Google Drawing, Beach Scene (June): Click Here! Google Drawing - Back to School (September): Click Here! Google Drawing - Halloween (October): Click Here! I use Google Classroom and upload this assignment from my Google Drive so each student has a copy. I then have students work in small groups and follow the directions step by step. I often also give a basic preview of Google Drawings before the assignment so students are familiar with its basic layout. It makes following the directions so much easier when students have a preview before they start! In the end, we share our drawings together as a class!